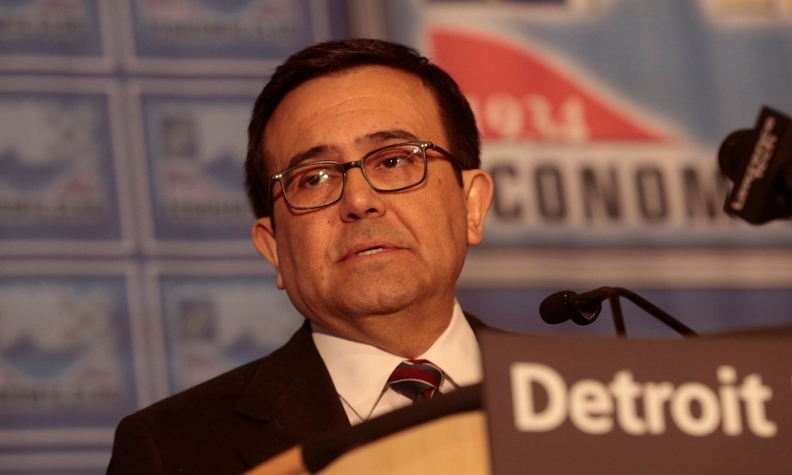 Ildefonso Guajardo, Mexico's economic minister, addressed the Detroit Economic Club on Friday. Mexico is prepared to negotiate changes to the North American Free Trade Agreement to modernize the 23-year-old open trade pact grouping the U.S., Canada and Mexico, Economy Minister Ildefonso Guajardo said on Friday. Guajardo said Mexico is prepared to discuss with the Trump administration and Canada revisions to NAFTA, such as including labor and environmental standards. Mexico "is willing to modernize NAFTA," he said. However, Guajardo said Mexico will not accept tariffs. U.S. President Donald Trump has called for new border taxes on Mexican-made goods. "It makes no sense to introduce an agreement with border restrictions or tariffs," he said. Speaking on CNBC, Secretary of Commerce Wilber Ross said a sensible trade deal with Mexico would help the peso, which he acknowledged had been hit by fears about what could happen to NAFTA. The peso hit a historic low on Jan. 11, after tumbling about 17 per cent on concerns that Trump would follow through on threats to tear up NAFTA. "It's a much more neighborly discourse," said Benito Berber, an analyst at Nomura in New York. "The best tool to help the peso is to change the tone on NAFTA." Berber said the recent signals from the U.S. administration were calming worries that Trump would seek to end NAFTA or impose hefty tariffs on U.S.-bound Mexican goods. Meanwhile, the peso rallied on Friday to a nearly four-month high after the new U.S. commerce secretary offered a softer tone on trade talks. In the interview, Ross highlighted rules of origin clauses in NAFTA as one of the pact's weak points, an area Mexico has said it is willing to discuss. "First of all, I think the rules of origin were far too lenient [in NAFTA]," Ross told CNBC. "Rules of origin means how much goods can come in from countries outside NAFTA — and yet get all the benefits of absolution from tariffs.... I think those can be tightened up quite a bit."